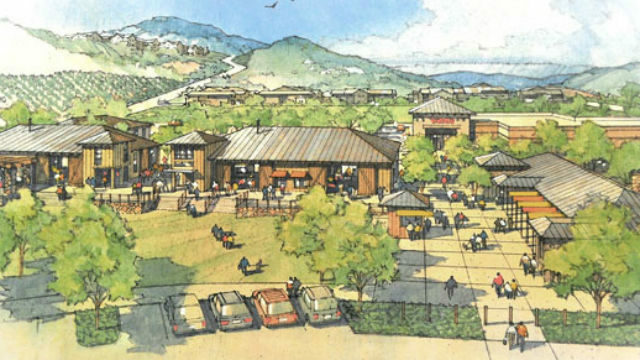 A rendering of the planned Newland Sierra Town Center in North County. Opponents of Newland Sierra north of Escondido announced Wednesday they have submitted more than 110,000 signatures for a 2020 ballot measure to stop the 2,100-home development. The controversial project was approved 4-0 last month by the San Diego County Board of Supervisors, with several supervisors saying the region is facing a housing crisis and needs new construction. Opponents immediately began a signature-gathering effort for the countywide referendum, which will appear on the 2020 ballot if the signatures are verified and supervisors choose not to rescind approval of the development. Plans for the 1,985-acre site call for 2,135 homes, 81,000 square feet of commercial space, a six-acre school site, 35.87 acres of public and private parks, 19.2 miles of multi-use community trails, an equestrian staging area and 1,209 acres of open space. Opponents say the project will create unacceptable levels of traffic on Interstate 15 north of Escondido.